Little, Brown Books for Young Readers, 9780316355889, 464pp. 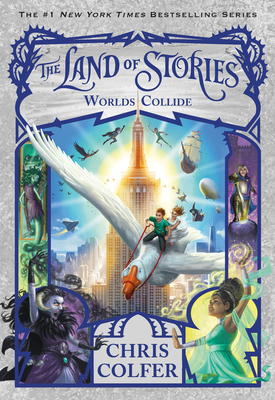 The epic conclusion to Chris Colfer's #1 New York Times bestselling series The Land of Stories. In the highly anticipated conclusion to the Land of Stories series, Conner and Alex must brave the impossible. All of the Land of Stories fairy-tale characters--heroes and villains--are no longer confined within their world! Conner doesn't think the situation could get any worse. That is, until Alex goes missing! Conner and his friends will have to fight their biggest battle yet. But without Alex by his side, Conner doesn't know how he will win the war and keep everyone he loves safe. Can the twins restore order between the human and fairy-tale world? Chris Colfer is a #1 New York Times bestselling author and Golden Globe-winning actor. He was honored as a member of the TIME 100, Time magazine's annual list of the one hundred most influential people in the world, and his books include Struck By Lightning: The Carson Phillips Journal, Stranger Than Fanfiction, and the books in The Land of Stories series: The Wishing Spell,The Enchantress Returns, A Grimm Warning, Beyond the Kingdoms, An Author's Odyssey, and Worlds Collide, and the companion books A Treasury of Classic Fairy Tales, The Mother Goose Diaries, Queen Red Riding Hood's Guide to Royalty, The Curvy Tree, and Trollbella Throws a Party.